Reps. Walter Jones, left, and Bob Ney announce the name changes on House menus at a Tuesday news conference. 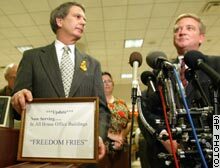 WASHINGTON (CNN) -- The cafeteria menus in the three House office buildings changed the name of "french fries" to "freedom fries," in a culinary rebuke of France stemming from anger over the country's refusal to support the U.S. position on Iraq. Ney, whose committee has authority over the House cafeterias, directed the change, after colleague Walter Jones, R-North Carolina, circulated a letter suggesting such a move. Jones said he was following the example of a local restaurant owner in his North Carolina district. "I represent a district with multiple military bases that have deployed thousands of troops," Jones said in a statement. "As I've watched these men and women wave good-bye to their loved ones, I am reminded of the deep love they have for the freedom of this nation and their desire to fight for the freedom of those who are oppressed overseas. Watching France's self -serving politics of passive aggression in this effort has discouraged me more than I can say." The name change was criticized by one young man in a House cafeteria. "That's completely ludicrous to me," he said. France has pressed the United Nations to give weapons inspectors more time in Iraq, saying the U.S. and British-led move to war is premature. Its stance has angered some U.S. lawmakers. Rep. Jim Saxton, R-New Jersey, has introduced legislation in the House that would block any French company from receiving U.S. government aid or financing in any reconstruction of Iraq. Another measure discourages American tourists, businesses and the government from participating in the 2003 Paris Air show. But House Majority Leader Tom DeLay, R-Texas, said he didn't think Congress needed to take any formal steps to signal its disapproval of France. "I don't think we have to retaliate against France," he said. "They have isolated themselves. They have resigned from any responsibility for the war on terror." Asked why he was focusing on France when other nations, including Germany and Russia, oppose the U.S. position on Iraq, Jones said it was because France had taken the lead in challenging the United States. Officials with the French Embassy in Washington could not be reached for comment Tuesday afternoon. -- CNN Congressional Correspondent Jonathan Karl contributed to this report.